Is it possible to print the bill again? Yes. To print the receipt again, in POS application open section Přehled účtenek, choose receipt and then choose Znovu vytisknout/Reprint. One of my customer wants to see the the preview of the bill. You can print the preview before printing the fiscal bill. Chose the possibility NÁHLED ÚČTENKY before printing the bill. After printing the bill customers decided to chynge the type of payment. How can I change it? Click on the menu box in the top left corner and choose Přehled účtenek. Finf the given bill, click on it and choose at button PLACENO - then change the type of payment. I have regular customers wich I want to present with discount. How can I do so? Before you confirm the type of payment choose the option BEZE SLEVY/WITHOUT DISCOUNT and choose your own value in CZK or one of the default amount in %. TIP: Each discounted or cancelled receipt are recorded to the system and are visible in Web Network Administration in section Receipts/Účty, subsection Control of cancellations and discounts/Kontrola storna a slev. To click on Hotově/Cash or Kartou/By card you can finish the payment. If you pay by a card and don't have a payment terminal by Storyous you must type the amount in. If you don't want to finish a payment and need to go back just click on the x in upper corner of pop up window (1). Then you can still make changes. All finished bills you can find in section Účty - Účtenky. Do you want to appreciate your customers and give them discount? No problem! You can give discounts as a percentage share of the amount of the bill, or you can give discount in CZK depended fully on you. Click on ZAPLATIT/PAY (vše-together/zvlášť-separately) and wait for the pop-up window. Click on BEZE SLEVY and you will see which kind of discount you can give. Choose VLASTNÍ SLEVA, when you want to set the discount in CZK, or at any of default discounts in %. confirm and the discount will be deducted from the previous amount. You will be brought back to finis the payment. On the left side yo will see the price before discount and on the right side there is newly stated price. Note: Discount you can use also when using vouchers. All receipts you can find if you click in upper left corner and then you´ll choose Přehled účtenek/Receipts list. If you tap on the receipt you can see details and also cancel the receipt. 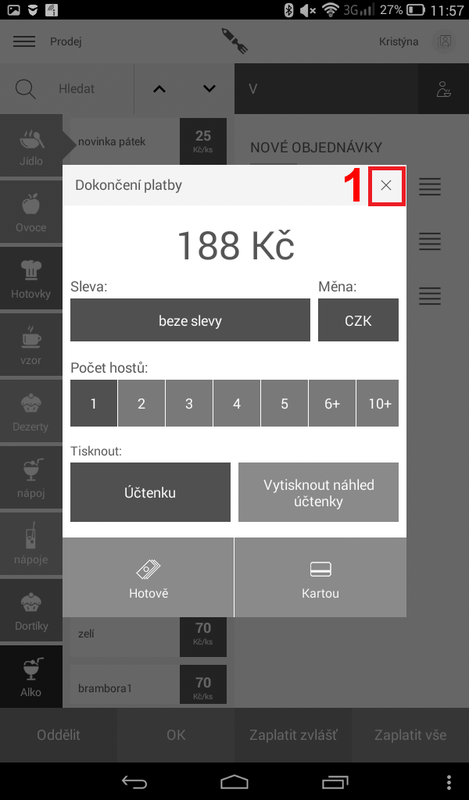 In the section Přehled účtenek/Receipt list if you tap on the receipt (1) you can change the payment method (2) and the number of persons (3). To reprint receipt just tap on „Znovu vytisknout”/Reprinting receipt(1). A record of this action will be recorded in section Kontrola storna a slev/Supervision over cancellation and discounts.